Cayden Cailean (pronounced KAY-den KAY-lee-en) is a chaotic good deity, also known as the "Lucky Drunk," "Drunken Hero," or the "Accidental God." Before he successfully completed the Test of the Starstone, the man known as Cayden Cailean was a Nevean sellsword and freedom fighter working out of Tarsis. He strongly believed that no man should hold power over another, and went so far as to leave jobs unfinished rather than violate his principles. His refusal to compromise his ideals was as well known as his love for drink, and the combination of the two resulted in a less-than-favorable reputation among potential employers. Ultimately, however, the latter would lead to the man's ascension to the pantheon. Cailean never planned to become a god, but when a drunk friend challenged him to take the Test of the Starstone, an equally inebriated Caelean accepted, forgetting that only two mortals, Aroden and Norgorber, had passed the test. Legends abound regarding the challenges Cailean faced at the Starstone, but no one knows the truth of what happened. Regardless, after three days had passed, the sellsword — to everyone's surprise — emerged as a deity. Cayden Cailean has lived his immortal life much as he did his mortal one. He holds freedom and adventure in high regard, and opposes tyranny and oppression on principle. He willingly accepts challenges when they are issued, although not as a point of honor; he sees no shame in retreating when necessary. One instance of note is the fall of the devil Salicotal, who grew infuriated with Cailean during a duel of dares, and attacked — only to be defeated at the hands of the god. Cayden Cailean makes a point of avoiding trouble with his peers as much as possible, although he responds to challenges quickly, and has little patience for the less-benign divine powers. Cailean particularly favors Desna, Sarenrae, and Shelyn, and has been known to keep the company of Calistria from time to time. He finds Erastil, Abadar, Gozreh, and Irori tolerable to be around, but difficult to agree with on certain matters. Torag shares the Lucky Drunk's love of ale, and the two have been known to compare human and dwarven brews on occasion. Cayden Cailean is an unassuming deity. After his ascension, he appears much as he did before completing the Test of the Startstone. He is usually depicted wearing chainmail and bearing a tankard of ale in one hand, sometimes accompanied by a rapier in the other. Additionally, he is often shown in combat against hosts of devils. Occasionally, his wrists are adorned with broken shackles, representing his doctrine of freedom for both body and mind. Creatures that exemplify bravery and freedom hold special honor in the mind of the Drunken Hero. Cayhounds, satyrs, and rust monsters are prime examples. This celestial cayhound is the son of Thunder, Cayden Cailean's pet mastiff. He enjoys strong beer and battle, but goes out of his way to ensure the safety of innocents. At first glance, it would seem Luthier's love for fine wine has dulled both his senses and wits. But in times of need, the Knight of the Vinyard becomes alert and ready to fight. His agility and precision in battle make him a deadly enemy and a valued ally. Before rising to the status of Herald of the Accidental God, Thais was a prostitute and friend of the then mortal Cayden Cailean. The two adventured together on more than one occasion, and after her death the now divine Cayden claimed her spirit and placed her in her current role. A goodly priest and historian who was killed in battle, this ghost insists that beer is the greatest of mankind's innovations. Valon dearly misses the body he once had, and readily accepts the opportunity to possess an individual and once again experience the world of the living in exchange for his assistance. The faithful of Cayden Cailean hold their patron's two loves, freedom and drink, as the pillars of his church. Free to seek their own means of venerating the Drunken Hero, it's not uncommon for followers to take part in events involving one or both of these. The creation and drinking of spirits is often considered a noble and holy, though not formal, pastime. Likewise, the act of fighting for freedom, both that of others and of oneself, is highly respected and honored; both liberators and chevaliers are welcome additions to the Lucky Drunk's faith. Members of Cailean's church can be found anywhere on and in Alhara, but worship of the Lucky Drunk thrives in Ceralais, Neveas, Fahldane and Prav. Despite the church's promotion of drink, the faithful draw a line between drinking for merriment and drinking to excess. The latter is seen as the abuse of one of the deity's favored things, and as such is frowned upon. Similarly, although the faithful of Cayden Cailean are known to actively seek out danger and adventure, they recognize the need to withdraw when a situation turns sour. Stupidity does not equal bravery, and bravery should never be sought at the bottom of a keg. Cayden Cailean's favor might be rewarded with the discovery of fresh drink, while his displeasure may result in such beverages turning unexplainably sour. The majority of those who follow Cayden Cailean are simple people who seek simple pleasures in life. Those who brew and sell alcoholic drink often revere the Drunken Hero, as do those who partake of such fare. Adventurers seeking to promote goodness often find a sense of kinship with the deity, their goals of freedom and adventure mirroring those of the god of bravery. Cayden Cailean's clergy is comprised primarily of clerics, though a smattering of druids and bards can also be counted among their number. In the rare instances where any structure exists, the church favors a loose hierarchy. Typically, priests are free to spread the ideals of their faith as they see fit; the priests of the Lucky Drunk are often barkeeps, freedom fighters, or adventurers traveling alone or as part of a group. Matters of ceremony and high society are often held as secondary considerations to such individuals, and the clergy reflects this by limiting its formal dress to a simple brown tunic or robe and a red stole bearing the holy symbol of its patron. 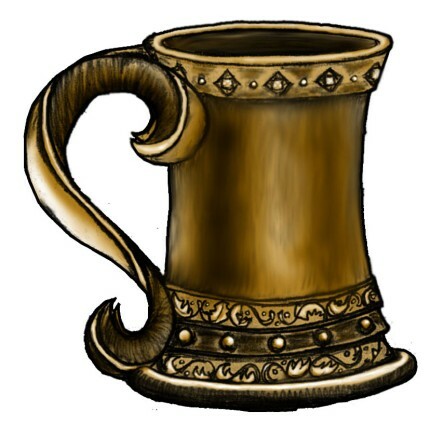 Many members also include a tankard as part of their formal garb, for luck and as a matter of practicality. Few buildings exist that serve primarily as a house dedicated to the worship of Cayden Cailean. However, smaller shrines to the Lucky Drunk are common in alehouses, inns, and breweries. When seeking divine assistance from such a house of worship, it's expected for to partake in its more worldly offerings; although such temples often donate their earnings to benefit the community, they are still run as businesses. The church also sponsors a large number of orphanages, and it's not uncommon for children from such locations to take the surname Cailean when they leave.